The Kumho Crugen HT51 is a highway all-season tire specially developed for drivers looking for year-round capability, durability, and comfort. 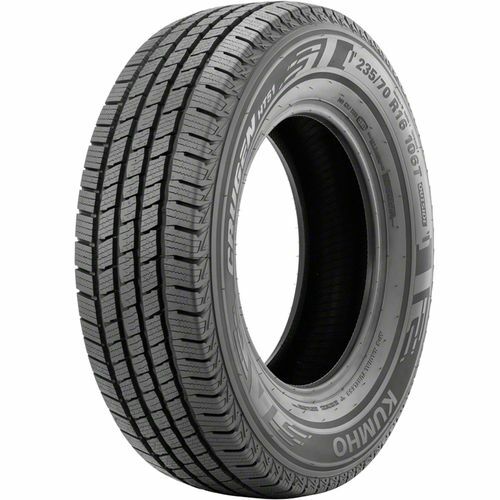 Ideal for light-duty pickups, crossovers, vans, and sports utility vehicles, the Kumho Crugen HT51 gives you confidence to drive on the highway with its special features. It is made with an all-season tread compound which gives you the capability to drive during all weather conditions including light snow. The asymmetric tread design has an optimized geometric block layout which extends its tread life even further. 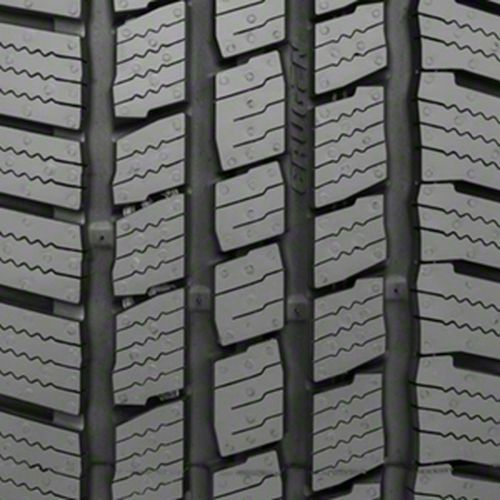 For straight-line stability and dry traction is the five-rib tread design which has a stiff center block. It is backed by a 70,000-mile warranty for Euro, P-metric sizes, and a 45,000-mile treadwear warranty for LT-metric sizes. 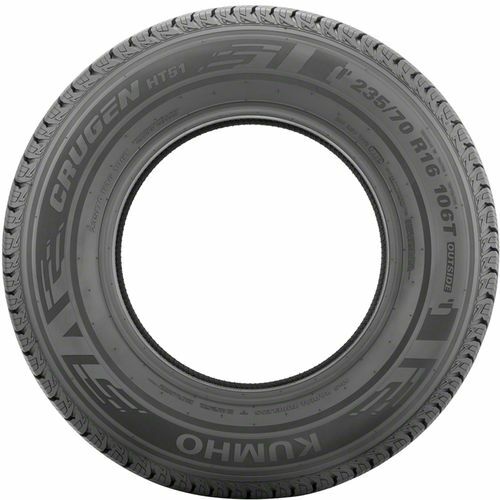 225/70R-16 720AA 1,929 lbs 51 psi 13/32nds 6.0 - 7.5" 9" N/A 28"
Purchase includes the Kumho Crugen HT51 tire only. The wheel rim shown in the picture is not included. Picture provided is a stock picture from the manufacturer and may or may not reflect the actual product being ordered. All Kumho Crugen HT51 tires are continuously developing with manufactured improvements. With that said, Simple Tire and the manufacturers have the right to change these tire specifications at any time without notice or obligation. Please Note: Specifications of the Kumho Crugen HT51 tires shown above are listed to be as accurate as possible based on the information provided to us by Kumho tires. This product is covered by a 75,000 mile manufacturer’s treadlife warranty. After checking out several brands I chose these for my 2014 Ford F 150. I am satisfied with the handling of these tires on wet roads, the ability for good and proper steering on dry or wet roads, I find no issues with noise. 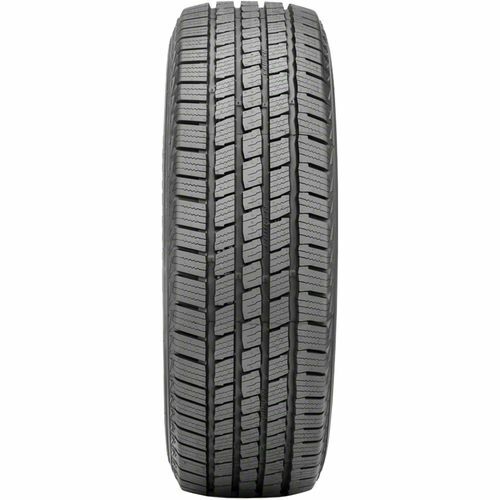 I am satisfied with the quality of these tires, as Simple Tire made the process easy. Delivered as promised. Terrific price compared to others, yet these had a higher mileage warranty. I no longer live in the North, so can not give my perception of how the tires would handle, but I would say they would be comparable with other brands, as well as what we sometimes face in the South. I recommend these tires. Overall I like the tires but when it comes to noise can’t say the same. But I understand why though. I would recommend these tires to anyone that doesn’t mind a bit of noise. I work for UBER here in NYC. Been through all 4 conditions already. Snow,Ice ,Rain and dry. Wouldn’t be surprised if these tires could do well off-road.